St. Mary’s, designed by Sir George Gilbert Scott, was dedicated in 1858, ten years after the congregation was founded. Over the years, the church has been extended and improved. In 1994, a major restoration was approved. With substantial grants from the Heritage Lottery Fund, Historic Scotland and the Scottish Episcopal Church, along with local support and continuing work by the congregation, the essential repairs to the stonework, roofs and stained glass windows were undertaken. Interior decoration, the restoration of the reredos (John Duncan 1886 - 1945) and the refurbishment of the halls and kitchen followed. The work was led by Howard Price, a member of the congregation. A service of Thanksgiving and Celebration was held in December 2002. Recently a couple of glass negatives were found at the back of a cupboard in the church. These are prints taken from them. 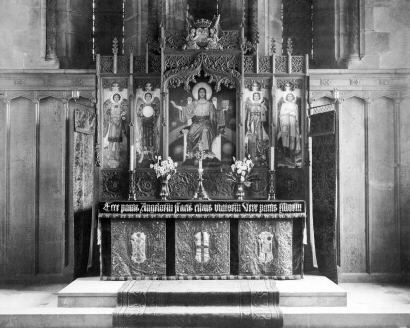 We think this is a photograph of the reredos when it was dedicated on Christmas Eve 1917. It was designed to fit in with Robert Lorimer’s panelling of 1911. The reredos was painted by John Duncan (1886 - 1945). The central panel represents Christ as King of Kings. He is flanked by the four Archangels, from left to right, Gabriel, Uriel, Raphael and Michael. 1886: The organ was built, a gift from the Don family. It was enlarged in 1892 and electric action installed in 1950. In 1982 J W Walker and Sons carried out a complete overhaul. In 2014 new electrics and a new console were added by Lightbowns Organ Builders. 1911: The church was extended westwards and eastwards and the east window raised to provide for a reredos at a later date. The choir entrance by the stairs on the south east side was installed and the choir stalls put in place. The designer for this was Sir Robert Lorimer. 1915: The pulpit, designed by Lorimer and given in memory of Dr George Mackness, Rector of St Mary's for thirty-eight years, was consecrated on Easter Day. 1917: The reredos was gifted and dedicated on Christmas Eve. Other gifts donated around this time include the Bishop's chair, the processional cross and two gold patens and chalices. 1921: The chancel screen was dedicated as a war memorial to members of the congregation whose lives were lost in the 1914-18 war. Further names were added following the 1939-45 conflict. 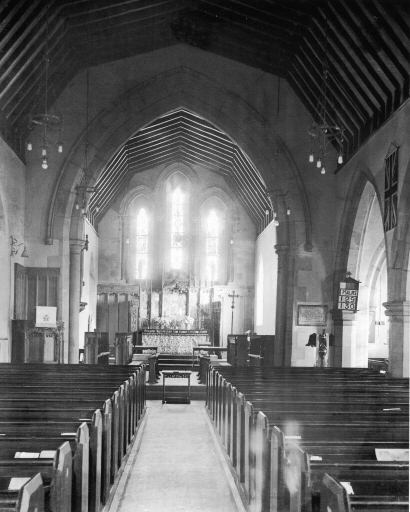 1923: The hall under the church was enlarged and improved. It had been used as premises for the Sunday School for 20-30 years. Often referred to as the "dug out", it had an earth floor so the children always arrived home from church dirty. 1934: The time of Morning Service was changed from 11.15am to 11.00am to avoid the sermon coinciding with noisy trains at midday! 1934/45: The church hall was taken over as an emergency centre and members of the congregation ran a canteen for troops based in the area. 1953: All Saints Chapel was created in the side aisle. The reserved sacrament is kept here and the chapel is used frequently for weekday services. 1962: Change from coal to oil fired central heating. This was changed again to gas fired central heating in 2013. 1964: Church halls, vestries and cloakrooms upgraded. 1976: Garden of Remembrance, situated to the west of the church, dedicated by Bishop L. E. Luscombe, Bishop of Brechin. 1977: A Book of Remembrance was gifted and is kept in the chapel. 1980: Further alterations and improvements were carried out to the premises under the church; notably new flooring in the two main halls, the addition of a new cloakroom area and the kitchen upgraded. 1981: The pews from the font area were removed to provide flexibility and more open space, particularly for children. 1983: High Altar moved forward to allow the Priest to celebrate Holy Communion facing the congregation. 1998: Substantial grants from the Heritage Lottery Fund and the Scottish Episcopal Church, as well as support from Dundee City Council, local and national trusts, Historic Scotland and efforts by the congregation produced sufficient funds for a major restorative programme to commence. These essential repairs to stonework, roofs and stained glass windows were largely completed by the end of 1999. 2000: Plans were drawn up for interior painting and electrical work. New railings were erected and ground on the south side landscaped. 2001: Current lighting and sound systems were installed. 2002: Interior decoration of the church completed in keeping with original colour schemes favoured by Sir George Gilbert Scott. Reredos restored. Modernisation begun on halls and kitchen. 2011: Large Church Hall rented out to Balgillo Nursery Too.